Canal boats come in all shapes and sizes. Designed originally to maximise load carrying capacity on the commercial waterways, little has changed in the last 200 years with respect to overall dimensions. The overall shape of canal boats has remained consistent over the years, but the design is now focused on comfort rather that carrying maximum freight. Hull Types… What Do You Need To Know? 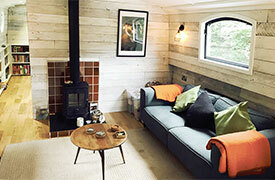 A question for many is whether or not there are any standards to which narrowboat shells should be built to. The short answer is yes there are and this is what the Recreational Craft Directive (RCD), introduced in the late 1990‘s, attempts to set out. Revised in 2003 to include personal craft, the RCD is intended to harmonise the safety requirements related to the design & construction of boats across Europe. It applies to new and second hand recreational craft from 8ft (2.5m) to 78ft (24m) in length, personal watercraft, marine propulsion engines and components placed on the market for the first time after 1998. For more information see our in depth guide to the RCD in the Certification chapter. 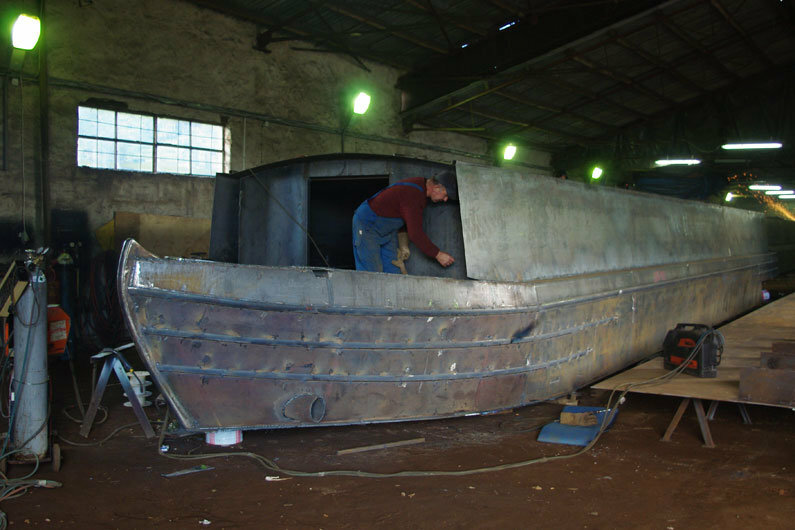 There are as many different types of hull design as there are narrow boat builders. The canal boat was originally constructed to fit the design limitations of the waterways upon which it operated. Many modern constructions pay homage to these craft of yesteryear with design references to historic styles of bow, stern and cabin sides. What looks good is purely subjective but there are some less obvious influences on the price and overall quality of the finished article which you would perhaps like to look out for. Regarding the type of steel used in the construction of the shell, there are several options available. 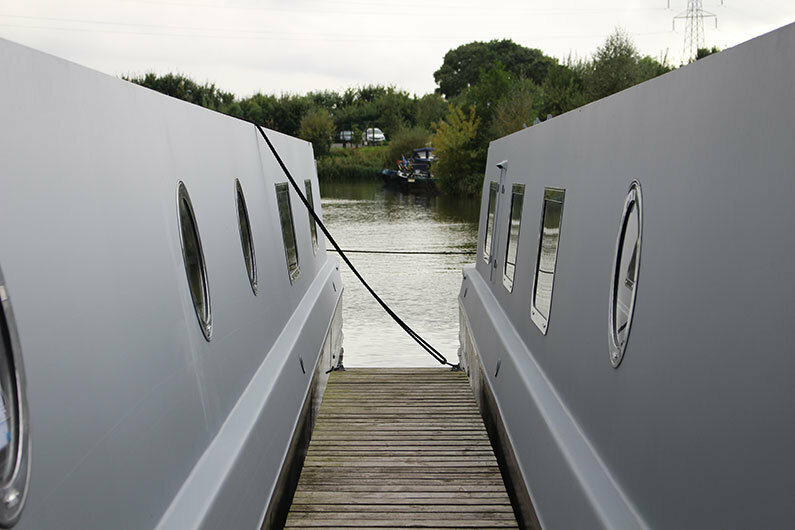 The RCD specifies an outline standard for steel plate and most canal boat builders will use a grade which complies to the minimum standard of BS EN10025. Be aware that steel plate does vary in quality and the award of a British Standard is no guarantee of longevity or suitability of the material as being fit for purpose. Note refer to RCD for exact wording of recommendations for steel quality. No matter how good the internal fit-out is, the shell will only ever be as good as the quality of the steel and welding. A common way of referencing canal boat steelwork is as follows: 10/6/5/4. These figures refer to steel thicknesses of 10mm for the bottom plate, 6mm for the hull sides, 5mm for the cabin and 4mm for the cabin top. This is not a set in stone standard so be aware that a boat constructed of steel stated as 6/5/3 will still give many years of service if the original steel was of good quality and the boat is subsequently well maintained. If you are purchasing a canal boat sailaway or a brand new boat, consult your narrowboat builder to understand the steel specification of your new boat. 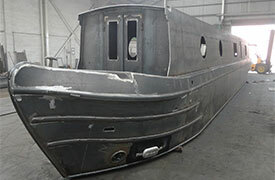 We are, in general, dealing with boats designed to travel the inland waterways. Their use has evolved from being able to carry the maximum amount of freight to now carrying the maximum amount of comfort. Therefore with regards to canal boat shell design requirements in fact not a lot has changed! Rivers excepted, there are physical restrictions on hull design. The primary considerations are the length and width of locks and the depth of the canal or waterway to be navigated. These physical restrictions also determine the speed at which any craft can comfortably travel (hence the development of low revving, high torque engine & gearbox systems). As such we have a craft which has evolved to have stumpy front & rear ends and a shallow, flat bottom. A heavy engine, usually in the stern, drives a propeller restricted in size by the minimum depth of the water in which it has to operate. So, design has changed very little since the 18th century. Complex bow and swim designs are expensive to manufacture. Any efficiencies that may be gained are often negated by the environment in which the craft operates and as such it is almost impossible to design a narrow boat which is able to navigate, lets say, the Huddersfield Canal in its entirety and the Humber Estuary with equal poise. Bow design originally allowed the hull to overcome some resistance, but with an eye on load carrying capacity. The harsh working life also determined a physically strong design and as it was a horse that provided propulsion there was not a great deal of mind towards economy. Modern bow designs allow for the above capacity and strength requirements whilst the market dictates what “looks good”. A radical design may not be to everyone’s taste and could affect resale value. A longer swim will assist in the boats stability but then there are many craft with happy owners whose swim length is restricted due to the short length of the boat. A balance is struck. Equally, an “S” shaped swim with a fine termination will aid efficiency but this has to be balanced with the cruising style of the owner, the propulsion system, the depth of the water, engine efficiency, the weather, hull encrustation and a myriad of other variables, including that bit of rope around the prop that no-one realises is there! Plus it is expensive to manufacture when compared to welding in flat plates. 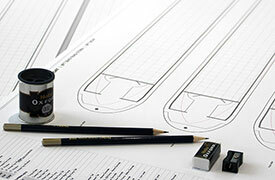 If you are looking to have a bespoke narrow boat built, you may be able to have input in to design of the hull shape. 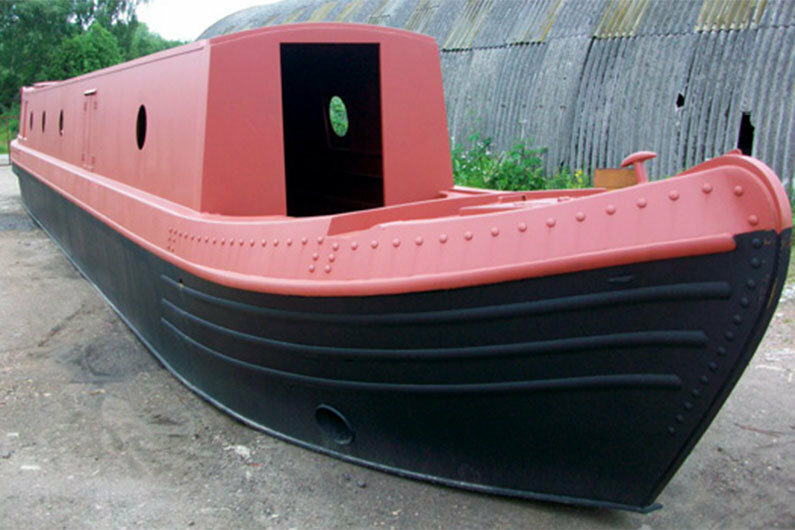 Some boat builders will have a standard design, however some narrowboat shell builders will be able to accommodate your design ideas. If you are interested in designing your own canal boat shell, it would be advisable to use The Fit Out Pontoon narrowboat design consultancy service to help make your design ideas a reality. For those of you wishing to have a craft built which will be used for sea voyages please be aware that there are specific design requirements relative to fundamental safety at sea that are not required for inland pleasure craft. Ensure you are dealing with a competent professional shell builder who has experience in this area.